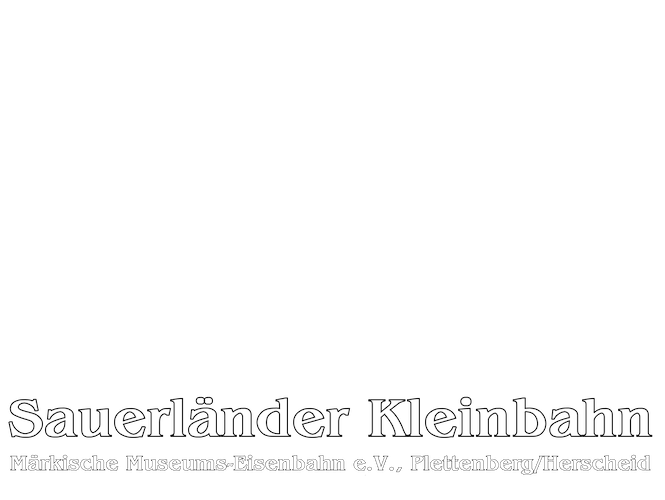 Relive the feeling of historical times – the museum trains of the SAUERLÄNDER KLEINBAHN are waiting for you. The one-metre gauge SAUERLÄNDER KLEINBAHN reminds you of the many narrow gauge railways of the local Sauerland. For our narrow valleys with their small factories they were the connection to the “whole world”. The railway association MÄRKISCHE MUSEUMS-EISENBAHN runs their vintage trains between the villages of Herscheid–Hüinghausen and Plettenberg–Köbbinghausen. Feel the railway atmosphere: smell the engine steam, feel the heat of the fire and experience the old ages. See all the railway machinerys in our work shed or around the station building, including preserved carriages from the closed local railways. Find out how a steam engine works or how we run our trains. Ask our staff and hear about our voluntary work and about the projects of our railway association. For the kids, Teddy Bear Day and Santa Trains. Concerts are performed in our vehicle depot. Watch all the railway activities from our cafe in the station building or from our lovely beer garden. Our museum shop offers all kinds of railway souvenirs, railway literature, films and pictures of our local railways. Take a look at our timetable (German language only). Combine your visit to SAUERLÄNDER KLEINBAHN with other sights of our region. Walk through our wonderful forests or along our reservoirs, or visit our technical museums.